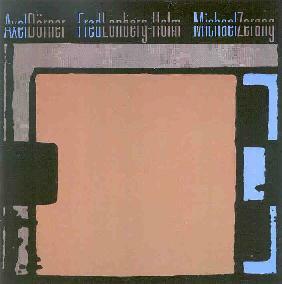 Axel Dörner, Fred Lonberg-Holm, Michael Zerang - "Claque"
Dörner (trumpet), Lonberg-Holm (cello and "hose segment"? ), and Zerang (percussion and tubaphone) team up to produce an interesting set that combines avant chamber music with noise, elements of jazz, and experiments with pure sound. It's sometimes difficult to tell what instrument is producing a sound and I'd often swear some form of electronics are being utilized. Lonberg-Holm's cello is usually the leader and wears many faces, from harsh and agonized bowed clatter to a variety of plucked tones. Dörner's trumpet is traveling incognito as I'm often unable to detect it, though when it does reveal itself it's to add bits of jazz to the proceedings. Zerang is credited with "multiple" percussion and indeed there's a variety including all manner of skins, cymbals, blocks and much else I'm sure. The highlights for this listener are the ventures into whimsical chaos ("Jar" is a standout track in this regard) that sound like avant garde tributes to Carl Stallings. The Meniscus web site refers to their recordings as being improvised and if that's the case on Claque then the communication between these musicians is impressive as much of the music is structured with such a sense of direction that I would have guessed it was composed. Other high points are the moments of cello and jazz trumpet that make for some of the CD's more interesting moments. The contrast and cooperation between the two is intriguing. At one point (on "Ranzen") the trumpet and cello seem to be dueling but in an instant come together in a single tone that took me by surprise for the sudden harmony it produced. Overall, an enjoyable set that will reward fans of small ensemble improvisation.